↑ Weil, Shalva. "Jews in India." in M. Avrum Erlich (ed.) Encyclopaedia of the Jewish Diaspora، Santa Barbara, USA: ABC CLIO. 2008, 3: 1204–1212. ↑ Weil, Shalva. "Cochin Jews"، in Carol R. Ember, Melvin Ember and Ian Skoggard (eds) Encyclopedia of World Cultures Supplement، New York: Macmillan Reference USA, 2002. pp. 78-80. ↑ Weil, Shalva. 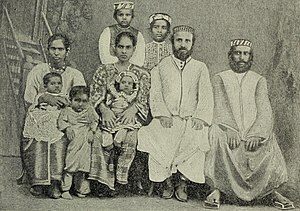 "Cochin Jews" in Judith Baskin (ed.) Cambridge Dictionary of Judaism and Jewish Culture، New York: Cambridge University Press, 2011. pp. 107. ↑ Weil, Shalva. "Kerala to restore 400-year-old Indian synagogue"، The Jerusalem Post۔ 2009. ↑ Katz 2000; Koder 1973; Thomas Puthiakunnel 1973. ↑ Katz 2000; Koder 1973; Thomas Puthiakunnel 1973; David de Beth Hillel, 1832; Lord, James Henry 1977. ↑ Place unidentified; possibly Keezhallur in Kerala State. ↑ Place unidentified; poss. Madayikonan in Kerala State. ↑ Place unidentified; poss. Palode in Kerala State. ↑ Weil, Shalva. "Symmetry between Christians and Jews in India: the Cnanite Christians and the Cochin Jews of Kerala," Contributions to Indian Sociology, 1982. 16(2): 175-196. Weil, Shalva. "'Symmetry Between Christians And Jews In India: The Canaanite Christians And The Cochin Jews Of Kerala" in Tim Timberg (ed.) The Jews of India, Delhi: Vikas Publication, 1986.pp.177-204. Jussay P.M. 1986; Menachery 1973; Menachery 1998. ↑ Weil, Shalva. "Symmetry between Christians and Jews in India: the Cnanite Christians and the Cochin Jews of Kerala," Contributions to Indian Sociology, 1982. 16(2): 175-196. ↑ David Solomon Sassoon, Ohel Dawid (Descriptive catalogue of the Hebrew and Samaritan Manuscripts in the Sassoon Library, London), vol. 1, Oxford Univ. Press: London 1932, p. 370, section 268. According to David Solomon Sassoon, the copper plates were inscribed during the period of the last ruler of the Perumal dynasty, Shirman Perumal. ↑ Ken Blady, Jewish Communities in Exotic Places. Northvale, N.J.: Jason Aronson Inc., 2000. pp. 115–130. Weil, Shalva. "Jews of India" in Raphael Patai and Haya Bar Itzhak (eds.) Jewish Folklore and Traditions: A Multicultural Encyclopedia, ABC-CLIO, Inc. 2013, (1: 255-258). ↑ Roots of Dalit History, Christianity, Theology, and Spirituality (p. 28) by James Massey, I.S.P.C.K. ↑ The Last Jews of Kerala, pp. 81–82 Weil, Shalva (with Jay Waronker and Marian Sofaer) The Chennamangalam Synagogue: Jewish Community in a Village in Kerala. Kerala: Chennamangalam Synagogue, 2006. ↑ The Last Jews of Kerala p. 111 Weil, Shalva. "The Place of Alwaye in Modern Cochin Jewish History." Journal of Modern Jewish Studies. 2010, 8(3): 319-335. ↑ Weil, Shalva. "A Revival of Jewish Heritage on the Indian Tourism Trail." Jerusalem Post Magazine, 16 July 2010. pp. 34-36. ↑ Excursus: The word used here in the Hebrew original is “Kena`anim,” typically translated as “Canaanites.” Etymologically, it is important to point out that during the Middle-Ages amongst Jewish scholars, the word “Kena`ani” had taken on the connotation of “German,” or resident of Germany (Arabic: Alemania), which usage would have been familiar to our author, Zechariah al-Dhahiri. Not that the Germans are really derived from Canaan, since this has been refuted by later scholars, but only for the sake of clarity of intent do we make mention of this fact. Al-Dhahiri knew, just as we know today, that German Jews had settled in Cochin, the most notable families of which being Rottenburg and Ashkenazi, among others. In ابراہیم بن عزرا’s commentary on Obadiah 1:20, he writes: “Who are [among] the Canaanites. We have heard from great men that the land of Germany (Alemania) they are the Canaanites who fled from the children of Israel when they came into the country.” Rabbi David Kimchi (1160–1235), in his commentary on Obadiah 1:20, writes similarly: “...Now they say by way of tradition that the people of the land of Germany (Alemania) were Canaanites, for when the Canaanite [nation] went away from Joshua, just as we have written in the Book of Joshua, they went off to the land of Germany (Alemania) and Escalona, which is called the land of Ashkenaz, while unto this day they are called Canaanites.” Notwithstanding, the editor Yehuda Ratzaby, in his Sefer Hamussar edition (published in 1965 by the Ben Zvi Institute in Jerusalem), thought that Zechariah al-Dhahiri’s intention here was to “emancipated Canaanite slaves,” in which case, he takes the word literally as meaning Canaanite. Still, his view presents no real problem, since in Hebrew parlance, a Canaanite slave is a generic term which can also apply to any domestic slave derived from other nations as well and which are held by the people of Israel. Conclusion: According to al-Dhahiri, he saw the German Jews in Cochin as being descendants of German proselytes. ↑ Shulman, D. and Weil, S. (eds). Karmic Passages: Israeli Scholarship on India. New Delhi: Oxford University Press, 2008. ↑ Katz, Nathan and Ellen S. Goldberg. The Last Jews of Cochin: Jewish Identity in Hindu India. University of South Carolina Press, p. 40. Also, Katz, Nathan, Who Are the Jews of India?, University of California Press, 2000, p. 33. ↑ Katz, Who Are the Jews of India?, op. cit., p. 32. ↑ Weil, Shalva. "'Today is Purim': A Cochin Jewish Song in Hebrew." TAPASAM Journal: Quarterly Journal for Kerala Studies, 2006. 1(3): 575-588. Weil, Shalva. "Jews in India." in M.Avrum Erlich (ed.) Encyclopaedia of the Jewish Diaspora. Santa Barbara, USA: ABC CLIO. 2008, (3: 1204-1212).